Best Broadheads for Hunting 2019- Fixed Blade, Mechanical or Hybrid? Best Broadheads 2019- Fixed Blade, Mechanical or Hybrid? To make your arrows go through your prey with maximum efficiency and precision, you will need to focus on what kind of broadheads to get. Depending on the type of prey you’re dealing with, as well as other preferences, you will need to pick the right type of broadhead from the many available. Another thing that you will need to bear in mind when you try to land a kill is to be ethical about it. Faulty or poor quality broadheads might not cut through the animal’s flesh, bone, and internal organs to ensure the kill, and that will lead to unnecessary suffering. For humane hunting, you will need to focus on such aspects of your broadheads, as well. Becoming educated on the types of broadheads on the market can take you a long way. Even if you are just a novice bowhunter, that doesn’t mean that you shouldn’t take advantage of all the possible enhancements and innovations manufacturers offer when it comes to broadheads. Ultimately, if you want to improve your performance as a bowhunter, you will need to pick your gear with maximum attention. That involves choosing the best broadheads, and that is the purpose of our guide. What types of broadheads exist? How many blades are present? Are Crossbow Broadheads Different than Regular Broadheads? Below you can find the top 13 broadheads on the market as of today. Commonly regarded as the best broadheads for deer hunting , mechanical broadheads fly like your target tips and open their full cutting blades upon impact with an animal. Fixed blades are tougher – no question, but mechanicals are easier to shoot. The lower profile of the unopened blades offers very little wind resistance while the arrow is in flight. Manufacturers routinely advertise the broadheads will fly just like your field points-and they do. Mechanical broadheads also offer very large cutting diameters that leave impressive entrance and exit wounds, not to mention extreme blood trails. Hunters will find they do not perform well on bone as some energy is lost when the blades open on impact with the animal, but they will certainly penetrate the ribcage. Check some of the best expandable broadheads below. The Rage Bowhunting CrossbowX is an excellent choice if you are looking for increasing your precision while making sure that you land a humane kill, without unnecessary suffering for the prey. A simple look at this model will tell you quite a few important things about how it is designed and what you can achieve with its help. One thing the manufacturer employs on these broadheads is the F.A.T. technology which stands for Ferrule Alignment. What this technology does is create the necessary conditions for improved aerodynamics, something you will want your arrows to have to travel farther and be more accurate. The Shock Collar technology ensures blade retention. The stainless steel blades will cut through with maximum efficiency. The broadheads are sold in packs of three, and they are available in the 100 and 125-grain versions. A free practice head is included with your purchase. These are maybe the best broadheads for a crossbow right now, along with one or two more models. Made of high-quality materials, this broadhead pack delivers as expected. For anyone who wants superior broadheads for humane kills, these will prove indispensable. The blades are made from stainless steel so that you can expect resistance to corrosion and rust. Also, the ferrule is made from aircraft-grade aluminum to keep the arrow weight to a minimum. To continue with the superior quality of the materials used, the point is made from high carbon steel that is hardened to ensure excellent piercing power. You will find these 2-blade broadheads in packs of 3, and in the 100-grain version only. The 2-inch cut they cause when they hit their target ensures that you will land a kill without a problem. It is the design of the blades, however, that sets these broadheads apart from the competition. There are two cutting edges, separate from one another, one that goes through the hide and the ribs, and the other will cut through the internal organs, for a guaranteed kill. If precision is what you are after, you cannot go wrong with this particular brand and product. Using top-of-the-line technologies, these broadheads will cut through hide, ribs, and internal organs, to ensure that your prey is down and doesn’t suffer. One of the technologies used by the manufacturer is the Shock Collar technology whose central role is to guarantee blade retention. While the broadheads are available in packs of three, the good news is that you get a free practice head that will let you try your hand at it, and get the hang of how the product works. Another thing that makes this type of broadhead so accurate and efficient is the hybrid tip that ensures that your arrow will go through with maximum precision. Also, the steel ferrule prevents splitting and damage to the tip, so that you don’t have to deal with an unclean cut. The stabilizer rings seem to be inferior and handling the broadheads must be done with care. The quality of the blades used on your broadheads is essential for landing a precise shot and an accurate cut. The Rage Chisel Tip SC is made to satisfy even the most pretentious bowhunters, and its stainless steel blades will ensure a kill without a glitch. But, of course, the blade quality is not the only thing that recommends these broadheads. Using the Shock Collar technology, they come with excellent blade retention, which means that the broadheads won’t come apart when they expand on impact. Again, such a feature contributes to the overall quality of this particular product. Bowhunters of various skill levels will appreciate the chisel tip that goes smoothly through anything. It can even go through bone, which means that your chances of scoring a kill when hunting down your prey are high. Each pack comes with a free practice head that will allow you to get a feel of how the broadheads work. This broadhead design truly deserves its name, as one look at it will tell you that you’re looking at a high-quality product. The manufacturer employed some innovations on this particular model, and you can expect superior performance in any way. The Slimline ferrule will reduce drag so that your arrows will fly through the air farther and more precise than ever. The Trophy tip is made from hardened carbon steel and will ensure that your shot will go through with maximum accuracy and cutting power. The latter is guaranteed by the three-blade design that is deemed more efficient than the two-blade design by many bowhunters. The blades are made from razor sharp stainless steel. Another thing that counts as a significant advantage for this broadhead design is the blade retention system. The system locks in place, and there are no O-rings or rubber bands to worry about. These are always one of our top choices when it comes to top rated crossbow broadheads. Often touted as the best broadheads for elk , these heads can be tough to tune out of your bow due to the fact that the blades act as rudders as the arrow is in flight. If your bow is even slightly out of tune, the broadhead will exaggerate the movement and throw the arrow off target. This often results in lousy minute resighting of your bow or adjustments to your rest to make your arrows fly properly. As a result, fixed blade broadhead manufacturers have been shy to expand the cutting diameter of their heads much beyond 1.25 inches. Mechanical broadheads have made huge strides in this area and now offer cutting diameters of 2 inches. One of the benefits of the fixed blade head is just that, the fixed position of the blades. They tend to be very sturdy, so they will withstand and even penetrate bone. Mechanical heads will struggle in this area due to the loss of energy, as the blades open on impact. Check some of the best fixed blade broadheads below. These fixed broadheads are created to deliver the most damage you can cause, as their six edges will create a wound channel that is two and a half times larger than what you can expect to generate when using traditional models. Expect the same level of accuracy you would get from field points, and enjoy excellent results when using them. One aspect that you will most probably appreciate is the fact that these broadheads are quite lightweight. The reason why this happens lies with the aluminum ferrule that will keep your arrows on target, but without making them heavier than needed. As expected, the blades are made from stainless steel, and they are sharp, creating the wound opening you need for a precise kill. Another thing that you will like about these broadheads is that the blades are serrated, which means that they will remain sharp for a long time. Available in two versions, 100-grain, and 125-grain, these fixed broadheads come with their fair share of advantages. First of all, the helix design of the blades ensures that your arrows will go through when you are out in the field, and you want to take down prey. Another advantage is the ferrule made from one solid piece of steel for maximum accuracy. Expect to get the same results as when using field points, and take advantage of the reasonably large cutting surface that will allow you to get kills that will not make the prey suffer. 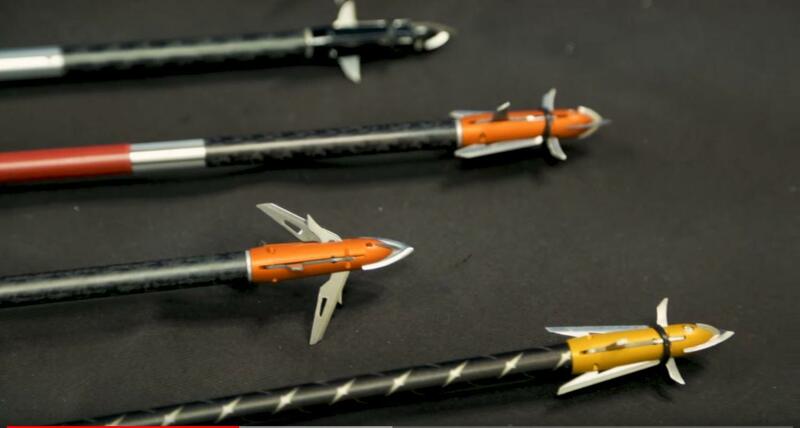 It should be mentioned that these broadheads were tested extensively before being launched on the market, which explains the consistent results they provide. The fixed broadheads ensure deep penetration, and the wound channels you’ll achieve will be massive. For deadly accuracy, you will find these 100-grain and 125-grain broadheads to be precisely what you need. One benefit of these fixed broadheads is that they work for any bow you want. Also, they can be resharpened for prolonged usage, so investing in just one pack of three can take you a long way. The cutting diameter is decent enough, but it is the precision and sharpness of the blades that make this particular product such a good choice for bowhunters everywhere. A version of a previous model, it offers some enhancements that seasoned bowhunters will observe right away. This new version is sharper than the one before, and it provides maximum flight capacity, among other benefits. One thing you should know about these broadheads is that they are spin tested and deployment tested. That minimizes the failure rate, and you will notice that the broadheads are very durable and have good sharpness retention. Should you desire, you can resharpen the blades for extra usage. If devastating wound channels are what you are after, it is worth a few minutes of your time to look at these broadheads. The way the blades are angled ensures that you will acquire deep penetration, as well as large wounds. As they are fixed broadheads, there are no moving parts you have to worry about or replace. You may be happy to learn that the cutting edges on this model can be resharpened, should the need arise. Made from steel, the broadheads are tested for spin accuracy, and you will observe soon enough that they are created for heavy use. You can purchase the 85-grain, the 100-grain, or the 125-grain variety, so there is plenty of versatility to enjoy. Extensively tested for spin accuracy, strength, deployment, and sharpness, these fixed models will enhance your performance and you’ll also be able to hone your skills as a bowhunter. The Muzzy Trocar 100 Grain is the optimal choice if you are looking for broadheads that can provide excellent accuracy, at the same time with arrow stabilization. The helix design has something to do with the superior performance of this fixed model, and you will find it easier to score kills even when your prey is located at long distances away from you. The tip is made from hardened steel which means that you will benefit from deep penetration, while the ferrule will keep the arrow on track even when hitting a bone. You will enjoy the benefit of cutting through anything, and the large diameter of the wounds caused will ensure ethical kills. You don’t need to be knowledgeable of how the broadheads actually work. You only need to screw them in, as they are delivered ready to go. The blades are razor sharp and dropping your prey will become more comfortable than before. When it comes to hybrid broadheads, there is one model that seems to garner more positive reactions than others in the same category. Created by a company with an excellent reputation for making broadheads that can open clean cut wound channels with maximum accuracy, this model is no exception. Starting with the steel ferrule created with aerodynamics in mind, these broadheads will make your arrows fly and hit the target for a sure kill, provided that your aim is good and you take your time to land the shot. Should you want to practice, a free head is included in the pack for this reason only. The hybrid tip, however, makes it a better pick than mechanical models. Its increased penetration power will make your shots deadlier than ever, and you will also benefit from improved precision. Also, the blade retention is top notch, as the Shock Collar technology employed will do its job. Are you looking for large entry wounds that guarantee a take-down without a glitch? Then you may want to hear about the Muzzy Trocar HB Hybrid. This broadhead model offers some excellent features that contribute to your deadliness as a bowhunter. Sporting 4 blades, it is more potent on impact than other hybrids on the market. The presence of multiple blades creates more than just an opportunity for a deadly shot. It offers a cutting surface of 2-5/8 inches, with a fixed diameter of 1 inch, and the rest counting as expandable diameter. Even more, the tip will crush any bone in its path, making sure that you land a kill. You will benefit from the steel ferrule that guarantees that your arrows will stay on track and that penetration is achieved successfully, even when you are hitting bone. Made in the US, these broadheads offer superior quality in every way. The arrangement of blades on this broadhead will convince you from the get-go that you will get a kill, as long as your aim is true. These 100-grain broadheads come equipped with four blades that are disposed in such a manner that the two that make contact first will cut through hide and bone, while the other two will take care of penetrating internal organs for a quick and humane kill. Some might argue that broadheads with four blades do not travel as far as two-blade models. But that is not the case with this particular model. The unique design makes the arrows travel as far as two-blade broadheads, but, at the same time, you will benefit from the destruction power only four-blade models can provide. You will get excellent cutting power, due to the V-notch chisel tip that the manufacturer takes great pride in. If you’re looking for accuracy and killing efficiency, this model is the one you should get. Seasoned hunters agree that choosing the right broadheads is equally important to selecting the right bow. As your ability to land a kill and take down your prey depends mainly on how efficient and humanely designed your broadheads are, you should pay extra attention to what the market offers for hunters at this point. We are here to introduce you to the different options available, as well as some useful tips. If you take a look at what bowhunters talk about on the specialized forums, you will notice that there is a bit of a debate regarding what kind of broadheads to use: fixed or mechanical. That should give you the first hint on what types are available. There are actually three types of broadheads you should learn about. Let us break them down for you with their ups and downs. A modern option that will surely catch your eye when you shop around for broadheads will be the mechanical type. You will also see them under a different name, which is expandable broadheads, and that gives you a clear idea about what they do and how they work. What happens is that the tip of such a broadhead will trigger the expansion of the blades the moment it hits a target. The immediate advantage is that you will get a large entrance point, which, in turn, means that you will cause quite the damage. For scoring a kill, the size of the wound, as well as the penetration, are essential for making it ethical. You should be aware, however, that the moving parts may be a cause for troubles, as they can come loose. Also, the penetration is not as deep as it is the case when you’re using a fixed blade. The advantage of having large would channels comes, as you see, at a price. However, as always when comparing hunting gear, we advise you to weigh the pros and cons of each type of broadheads. Besides the advantage mentioned earlier, you will also have the benefit of a straighter line of flight. The low drag of this design will also make sure your arrows will travel farther than when using traditional broadheads. Taking the broadheads apart from cleaning can be a bit of a hassle. They might not be that easy to resharpen, as well. Plus, among all the broadheads that we’re presenting here, they are the weakest, so they may not be your logical choice when you want to drop big game. The simple and straightforward design of fixed broadheads will tell you right away that this is a type of gear you can rely on. They do not have to be made of different materials, and they don’t have to work with removable parts. Even more, this tried and tested design has been around for a long time, and especially for larger prey, you will find them to be more useful than the mechanical option. One of the main advantages of fixed broadheads is their cutting power. The blades are easy to resharpen usually, and they are also honed to perfection by the manufacturers that are worth their salt in the field of bowhunting gear. What happens when they hit the target is that the arrow reaches deeper inside the animal’s body, hence ensuring a humane kill. Choosing a good quality broadhead depends on various factors, and ethical killing is an essential consideration. You will discover that fixed models manage to get deeper and can go through hide, flesh, bone, and internal organs, therefore helping you score a kill without the unnecessary suffering of the prey. Various configurations are available, but three or four blade models are the most popular. You will notice with ease that these broadheads tend to be much more durable than others. They are usually made from one solid piece of metal, so there are no moving parts that can break when you least expect it. The deep penetration comes as another upside of this type, and so does the fact that they are cheaper than the rest. If you are starting as a bowhunter, you may want to try using such broadheads first. You might have already guessed that hybrid broadheads are those that come in the middle between mechanical and fixed models. But what makes a broadhead a hybrid? A look at the design will tell us everything you need to know. The tip is just like the one we find on fixed blades, which means that you will obtain that cut-on-contact effect the fixed models are so much praised for. However, the part after the tip is nothing like the one used for the fixed variety. It is, however, similar to what you find on a mechanical broadhead, which is an expandable mechanism with blades that will ensure a large wound diameter. You may feel tempted to believe that there is nothing hybrids cannot do, seeing that they bring together the advantages offered by the other two types of broadheads. However, that is not true, and some disadvantages are relatively consistent throughout the models available in this category. One of them is that the flight pattern tends to be inconsistent. That means that more seasoned bowhunters are likely to use such broadheads, as they can compensate through skill such issues. You will also need to bear in mind the type of maintenance you will have to ensure to keep the blades working. There are some critical aspects to consider when you want to get the right type of broadheads for your needs. Here are some essential factors that come into play. The legal aspects are not to be taken lightly. There are US states that forbid the use of mechanical broadheads for various game categories, as they consider that the respective models can not ensure ethical kills. Make sure that you always check the local legislation for such aspects before packing for your hunting trip. You will notice that broadheads are sold in different weights expressed in grains. Depending on the level of penetration that you need to achieve – especially when dealing with large prey – you might have to rely on superior grain weights. This way, you will ensure that your arrows will go through the tough hide of the animal, and through bone, to reach inside the internal organs, and guarantee the kill. Fixed broadheads are made from a single type of material, but the other models are a combination of materials, so you might have to pay extra attention to which are used. Stainless steel for blades is a necessity, as it can be honed to be razor sharp and offer superior cutting power. For mechanical and hybrid models, the ferrule is good to be made of aluminum to avoid unnecessary added weight to your arrows. The tip material also matters, for the cutting power at the entrance point. The larger the wound the broadhead can cut, the larger the prey you will be able to take down. You will notice that all the manufacturers offer information of such aspects, to give you a clear idea about what to expect when you are using their products. It is essential to pick broadheads that can ensure accuracy close to field points, if not equal to them. That will help you hone your aim and land more successful shots. To make the best out of the broadheads you pick, there are other things you might want to bear in mind. Take a look at the following recommendations to ensure that your investment pays off. Not all the broadheads you find available are suitable for all the prey you can hunt indiscriminately, and that is why you should take a bit of time to see which ones work for what. For instance, many seasoned hunters still swear by fixed models if you want to take down deer. While some may argue that mechanical and hybrid broadheads work just as well for deer, not the same thing can be said about them when hunting elk, as expandable broadheads are known to fail against big-boned animals. Only the deepest penetration broadheads should be used for big game. Different models can come with varying numbers of blades available. That simple aspect can count a lot as on the number of blades can depend how devastating your shots are. They will also guarantee more consistent blood trails that will allow you to follow your prey when you happen to wound it without killing it. In the case of mechanical and hybrid models, you will need to know if there are any stabilizers in place. Old fashioned O-rings might work, but there are other technologies used now, such as Shock Collars that gain in popularity day after day. Pay special attention to the tip of your broadhead, regardless of a fixed blade or mechanical design. You will find either chisel tip, which is a basic pointed tip or cut on contact tips which are razor blade tips or small blades mounted at the tip of the head. I would suggest cut on contact type broadheads over chisel tip as it seems to me that especially in the case of a mechanical broadhead, if something goes wrong and the blades don’t deploy, you would still achieve a cut through the vitals. A chisel tip may be stronger and able to withstand a hit to the shoulder of a deer, but I would prefer to think that a cutting tip would result in more damage. Well, not really. It’s just that crossbow manufacturers push heavier broadheads (mostly 125 grains) on the market. If you are a crossbow shooter and you are looking for the best crossbow broadhead out there, the decision is very easy for you. You just have to know your crossbow manufacturer’s recommended arrow head weight. Just check the weight of the field points that came with your package or check on your manufacturer’s website or even call them and ask. Now that you know the recommended arrow head weight which for the most crossbows out there today should be 125 grains, click here for some of the best rated broadheads for a crossbow on Amazon.com! To ensure your success as a hunter, but also to make sure that the kills you land are ethical, you will need good quality, well-designed broadheads. That is why it is essential that you are familiar with all the types available, as well as what kind is suitable for various types of game available in the area you intend to hunt. You have seen earlier the ups and downs of mechanical, fixed, and hybrid broadheads. You have also learned about the importance of various considerations, such as weight, material quality, number of blades, and so on. The final decision belongs to you. Always bear in mind the recommendations offered here if you want to make sure that your shots will hit their target and that you won’t cause any suffering to the animals you intend to hunt.